Everyone has heard of Coca-Cola, and you would be hard pressed to find somebody who was unable to recognize the iconic white lettering against the bright red background of this global brand. 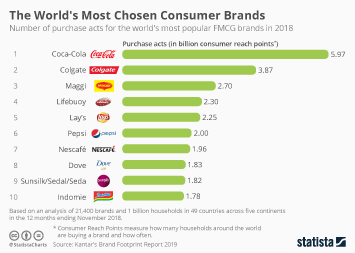 Various sources cite Coca-Cola as a billion dollar brand and that is not surprising, when one considers it was rated by Interbrand as one of the most valuable brands in 2017, based on a brand value amounting to 69.73 billion U.S. dollars. The Coca-Cola Company is a global key player in the beverage industry. The firm comprises the corporate division, headquartered in Atlanta, GA, and about 300 bottling partners worldwide. According to its most recent annual report from 2016, Coca-Cola's net operating revenue amounted to 41.86 billion U.S. dollars. The North American segment brought in about 15.4 percent of the global revenue in that year. The Coca-Cola Company’s four leading carbonated soft drinks brands in the U.S. were Coca-Cola, Diet Coke, Sprite, and Fanta. The Coca-Cola Classic brand itself held a market value of over 66 billion dollars in the United States in 2017.